Traces of Tracy Gregory: Launch Day Has Arrived! Free Download For a Limited Time! Launch Day Has Arrived! Free Download For a Limited Time! "Ways of War" is a work that has inspired me to take a closer look at human nature. We all have to deal with certain issues, and we struggle with behaviors that are a result of our environment. Whether we learn our behaviors from childhood or our experiences are learned as adults, we are all products of our environment. "Ways of War" in particular touches on the issue of PTSD through early programs that were labeled "mind control” before PTSD became the official term used for those suffering from the trauma relative to psychological abuse. Though some of what I discuss in the book may be extreme from one perspective, there are many people today that experience as much pain due to exposures that we might compare to those of the Cold War Era. In future novels, I will be addressing or exposing if you will, the trauma of military personnel during the Vietnam War Era. Which will eventually spill into more recent wars and struggles that cause our military and their families so much stress and heartache. I spent many hours researching the topic of mind control relative to the Cold War Era. What I learned is there are not enough hours in my lifetime to begin to touch on the mess made in the name of scientific advancements. No life is indispensable. No individual is disposable, and it breaks my heart to see the pain, so many people suffered in the name of science and for the sake of government power. I’m only one person, and the series that I will continue to write on this topic is for entertainment sake. I know that my writing will not change what has happened to the many men (and women) who suffered and continue to suffer the pains of war. I may not be able to change anything that has happened, but I hope I can make a difference, even if it’s small one. 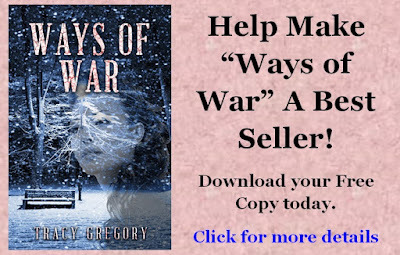 I will be donating 10% of all profits from not only “Ways of War” but for each book, in the series to our Veterans and their families. My heart goes out to anyone who has or will struggle with these psychological disorders. “Ways of War” is available now for your entertainment. Please download your free copy today. Honest Amazon reviews are appreciated.